It was the year of Me Too, Time’s Up and Never Again. And of Dreamers, Donald Trump and the big, bad, election-rigging Russians. Still, in what was supposed to be the most politically charged Oscar night in decades, host Jimmy Kimmel delivered an oddly colourless opening monologue. His schtick was characteristically sardonic, but the punchlines were uncharacteristically few and far between. One gem came towards the end of the monologue. “The most nominated movie tonight, a film that’s up for 13 Oscars, is The Shape of Water, written and directed by Guillermo del Toro, a wonderful man,” Kimmel bellowed. There were laughs and claps all around. The larger joke, however, was left unsaid. And that joke was on the Hollywood elite who had gathered for the awards night. Because, this was the year that they screwed up so badly, that they ended up not nominating one of the year’s best pictures (if not the best) for the Best Picture Oscar. And, this was also the year they gave the statuette to the worst of the Best Picture nominees. It is not to say that The Shape of Water, the enjoyable sci-fi fairy tale that bagged this year’s Best Picture and Best Director, is a bad film. It is merely an undeserving choice. And, one of the most naive and politically incorrect movies in this demanding age of political correctness. Let’s take the lead female character in The Shape of Water. Elisa is mute, and perceives herself to be, in her own words, “incomplete”. She is not attractive in the Victorian sense of the word, but is not unattractive either. The slender Elisa doesn’t eat much, but has a voracious sexual appetite: Every morning, she pleasures herself in the bathtub, like clockwork. The movie gives us cues that it is only natural for someone like Elisa, who works as a cleaning woman at a top-secret defence facility, to not have a boyfriend. When, finally, she does a land a boyfriend, it is a creature from the depths of the Amazon. How lovely. Granted, this is a fairy tale. But, even for a cornball film like this, del Toro lays it on rather thick. The villain is not just cruel, but he is also a Bible-quoting racist who is proud about not washing his hands after taking a leak. The foil for this cardboard American villain is a kind-hearted biologist, who is later revealed to be a Russian mole. He is portrayed as an exception to the Russian stereotype of vile, scheming losers. But the script is not kind to even the kind-hearted Russian. In the midst of all this is what Kimmel describes as the fish who falls in love with Elisa. The merman, as visualised by del Toro, is an intelligent, God-like figure who would fall in love with anyone who gives him boiled eggs. Best Picture material? Not quite. Then why did the Academy members pick The Shape of Water? The answer, perhaps, is that Hollywood is growing more and more infatuated with itself. The exceptionally talented del Toro is part of the growing league of Hollywood filmmakers who are happy to restrict themselves to producing movies that borrow heavily from Old Hollywood. The Shape of Water has elements from the musicals and creature movies of the forties and fifties. The merman itself is modelled on the monster in the 1954 horror film The Creature of the Black Lagoon. The pop culture references in The Shape of Water—songs like Carmen Miranda’s ‘Chica chica boom chic’, and ‘You’ll never know’ from the 1943 classic Hello, Frisco, Hello—will invoke nostalgia in the minds of anyone over 50. 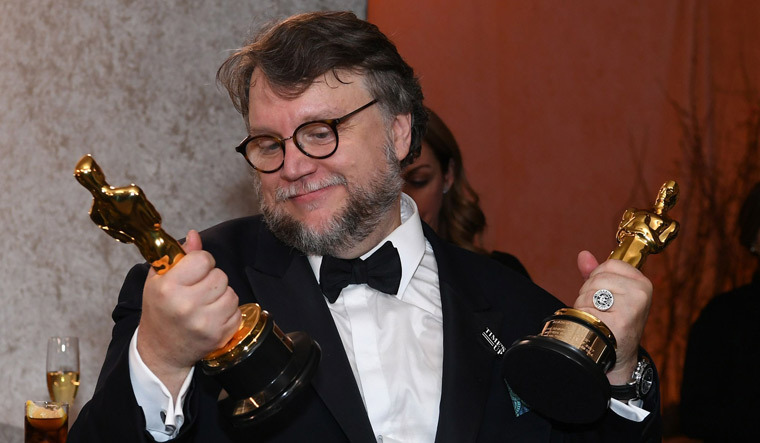 Guillermo himself is in his fifties, and so is an influential section of the Academy of Motion Picture Arts and Sciences, which gives out the Oscars every year. The Shape of Water is comfort food for the Academy—it is fresh, like popcorn, but not groundbreaking or controversial, like those Guy Fieri inventions. Another factor that went in the film’s favour must have been that del Toro was a Mexican. There is nothing that appeals more now to Hollywood than cocking a snook at Donald Trump. “I am an immigrant,” del Toro told the audience after accepting the Best Director statuette. “The best thing our industry does is to help erase the lines in the sand when the world tries to make them deeper.” The liberal Hollywood could not have had the satisfaction of hearing those lines from the other foreign director in the race—the Brit with the stiff upper lip, Christopher Nolan. Which brings us to the other reasons why this year’s Oscars was a giant letdown. In place of Harvey Weinstein and his ‘working the circuit’—which is Hollywood code for underhand campaigns to secure statuettes for one’s movie—we had the cash-rich Netflix springing a surprise by landing its first Oscar. Icarus, a Netflix documentary about the Olympic doping scandal in Russia, trumped the pre-Oscar favourite Faces Places, director Agnes Varda’s journey through rural France. In hindsight, how could have rural France outweighed America’s fascination with Russian villains? In two direct rebuffs to the Me Too movement, the statuette for Best Actor went to Gary Oldman and the one for Best Animated Short Film went to Kobe Bryant’s Dear Basketball. Both Oldman and Bryant have been accused of assaulting women, but there are no cases against them. Oldman is also a vocal critic of the Me Too movement. In his acceptance speech, he said he was “deeply grateful” to his mother, who was “99 years young next birthday”. He said she would be watching the ceremony from the comfort of her sofa at home. “Put the kettle on,” Oldman told his mother from the stage. “I’m bringing Oscar home.” Even the women were seen applauding. The biggest Oscar snub, however, did not happen on the night of the ceremony. It happened weeks earlier, when a micro-budget, independently-made film called The Florida Project was denied nomination for Best Picture. The Florida Project is about a six-year-old girl called Moonee, who lives with her mother in a cheap motel in Kissimmee, Florida. A small town, Kissimmee exists in the shadow of the Walt Disney World Resort, one of the world’s biggest entertainment complexes, spread across 110 square kilometres. The film derives its name from Walt Disney’s early label for the theme park he envisioned in Kissimmee. Disney’s dream was to build a futuristic township inhabited by modern, liberal and ambitious Americans. What materialised in the end forms the subtext of The Florida Project. In the film, Moonee, her mother and most of her motel neighbours are ‘white trash’— poor white people who cannot afford four square meals a day, let alone a trip to the Disney World. Still, the bright and bubbly Moonee lives like there is no tomorrow, finding happiness even in the most mundane of activities. In the climax of The Florida Project, Moonee and her closest friend, a ‘white-trash kid’ like herself, is shown trying to do what they have always yearned to: enter the paradise called Disney World. Crying and holding hands, they run and run and run, and reach the periphery of the giant theme park. We never catch a glimpse of whether the girls actually make it. Whether they are turned away at the gates for want of tickets, or whether Uncle Disney (or Uncle Sam, if you may) was kind enough to let them in. What we do know, however, after this year’s Oscar night, is that Hollywood is just not interested in genuinely thought-provoking films like The Florida Project. Who needs the pinch of reality when one could relish soothing fairy tales? And then, dutifully, everyone clapped again.